Olympics-Humble Doctor of Chiropractic to Lead Team U.S.A.
Humble Doctor of Chiropractic to Lead Team U.S.A. In 1900, men’s water polo became the first team sport introduced at the modern Olympic Games. The rules of the game were different in Europe, so in the 1904 Olympic Games in St. Louis the Europeans refused to participate. As a result, the USA won the gold, silver and the bronze. Ironically, this is the only gold medal that the US has won in Olympic water polo competition. Historically, the sport has been dominated by the Europeans. Hungary leads all nations with nine Olympic gold medals. The USA won bronze medals in the Olympic Games in 1924, 1932 and 1972. The US team was one of the best in the world in the 80s. With Terry Schroeder as the team captain, the USA won silver medals in the 1984 Olympic Games in Los Angeles and the 1988 Olympic Games in Seoul, Korea. In 1991, Schroeder led Team USA to the World Cup title in Barcelona, Spain. After the 1988 Olympic Games, Team USA spent the next 20 years struggling to get back to the medal podium. 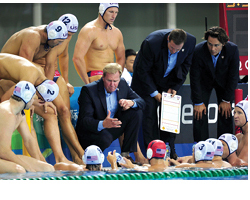 In June of 2007, with the team ranked 9th in the world, USA water polo hired Dr. Terry Schroeder to be the head coach. Schroeder led the Men’s National Team through a resurgence in 2008, garnering silver medals at the FINA World League Super Final and Beijing Olympic Games. The team’s success in Beijing was one of the great stories of the 2008 games. Dr. Schroeder is considered one of water polo’s all-time standout players. He captained the National Team from 1983-1992 and coached Pepperdine University’s men’s team for 20 years. Under Dr. Schroeder’s leadership, the Pepperdine Waves had a record of 307-195 (.612), attended the NCAA Championships eight times, and claimed the NCAA championship in 1997. Schroeder was inducted into the USA Water Polo Hall of Fame in 1998 and was recently inducted into the International Swimming Hall of Fame. A graduate of San Marcos High in Santa Barbara, CA, Schroeder earned All-American honors at Pepperdine in 1977, 1978 and 1980. He graduated with honors in 1981 and then completed his doctorate studies at Palmer-West Chiropractic School. Schroeder and his wife Lori (who celebrate 25 years of marriage in 2012) reside in Westlake Village, CA, with their daughters, Leanna and Sheridan. TAC: How do you see the U.S. Water Polo Team developing this year? Dr. Schroeder: Since January 2012, we have been training full-time. All the players agreed to stay at home this year and give up their opportunity to play professionally overseas. Each and every player realized the potential benefit of training together full-time for 7 months (January – July). We began the year with a trip to Australia for training and to compete in the Pan Pacific tournament. The training went well and we ended up beating Australia in the finals to win the gold at the tournament. After returning home, we have been training nine times per week. We train Monday through Saturday. A typical week looks like this: Monday – 8 am – 9:45 weights/cardio in the gym, 10 – 12 noon swim/legs conditioning in the pool at CLU, 7 – 9:30 pm tactics in the pool at Oaks. Tuesday – 8:30 am to 11:45 am in the pool at CLU for swim/legs/tactics. Wednesday – 8 am – 9:45 weights/cardio in the gym, 10 – 12 noon swim/legs conditioning in the pool at CLU, 7 – 9:30 pm tactics in the pool at Oaks. Thursday – 8:30 am to 11:45 am in the pool at CLU for swim/legs/tactics. Friday – 8 am – 9:45 weights/cardio in the gym, 10 – 12 noon swim/legs conditioning in the pool at CLU, 7 – 9:30 pm tactics in the pool at Oaks. Saturday 9 am – 11:30 am in the pool at Oaks/CLU or Pepperdine. Obviously, this is all the players do right now. They are not working and they are sacrificing a great deal of time with their families to make this dream a reality. Some are living with “host families” in the Conejo Valley and others have rented apartments. We have six married players and three of those have kids. Our team is really a large family. Mixed in with the training has been common training with other teams. We hosted Germany, Italy and Montenegro in March and then recently went to Serbia and Italy for training. Later this month we will host the World League Prelims with Canada and Brazil and then in late May Croatia and Hungary are here for a series of games and training. In June, we will travel to Kazakhstan for the World League Super Finals before we return home for our final preparations. The Olympic Games opening ceremonies is July 27, 2012. The training has been going very well and we are improving every day and becoming a better team. TAC: Has there been an increase in the use of chiropractors at the Olympic level that you’ve noticed as a result of some of your past successes? Dr. Schroeder: I do believe that chiropractors have continued to become more and more popular with Olympic athletes and teams. I would like to say that I had some small part of that increase; however, it is chiropractic itself that deserves all the credit. Athletes are looking for anything to give them an edge and more and more they are realizing that when your body is finely tuned and aligned you have the best chance to perform at your best. Only chiropractic offers the athletes a “hands on” natural approach to maximizing their potential. This is, after all, what the Olympic Games are all about – reaching your human potential, and what better way to do that than with chiropractic! TAC: Is this specifically only within the U.S. or more with international teams and competitors as well? Dr. Schroeder: The popularity of chiropractic has grown throughout the world. Through my travels at various international competitions (Pan American Games, World Championships, etc. ), I have met chiropractors who are working with many different countries and most all sports. It has been a joy to see this profession receive the attention and credit it deserves. TAC: Do you feel like a chiropractor without advanced preparation specific to the sports world is at a disadvantage, or not equipped to treat Olympic athletes? Dr. Schroeder: While it is true that many Olympic athletes are looking for a chiropractor that does some soft tissue work (ART, Graston, etc.) the adjustment is still our most powerful tool. I would certainly recommend to any chiropractor who desires to treat Olympic athletes to develop as many adjunct skills/tools as you can to help your athletes; however, first and foremost become the best adjuster you can be. TAC: Are there certain training programs that you’d recommend chiropractors pursue to become equipped to treat athletes at this level? Dr. Schroeder: To become an official chiropractor for the USA Olympic Team one must follow the criteria that is outlined by the USOC medical staff. You must be in practice for at least 5 years, must have experience working with a national team and must go through a two-week program at the Olympic training center. As I said, if your desire is to work with Olympic athletes, I would recommend learning some soft tissue techniques to add to your skills. Currently, we have a new chiropractic graduate working with our team who came from an athletic training background. Her name is Karen Bloch and she is doing a wonderful job with our team. If you are just going to be working with a specific team then it would also be a good idea to learn as much as you can about that specific sport. You must know how the body is stressed and the potential injuries to look for in each different sport. TAC: Have you treated any of the athletes that you are currently coaching? Explain please. Dr. Schroeder: When I started coaching this team in 2007, there were two or three guys that were familiar with and utilized chiropractic care. At this time, I have treated each one of our athletes. Every member of our Olympic water polo team is a regular chiropractic patient. They know the benefits and I am convinced that it is a part of our success. I have also been asked on numerous occasions to treat an athlete from one of the teams that we have been competing against. On our most recent trip to Italy, we were training against a club team called Pro Recco. This team is like a world all-star team. They have players from Serbia, Croatia, Montenegro, Italy, Hungary and Spain. Two of the very best players in the world, Andrija Prlainovic from Serbia and Thomas Kasas from Hungary, asked me to adjust them. Of course, I did and they too were introduced to the benefits of chiropractic care. One of our players, Merrill Moses, who is considered by many the best goalie in the world, is planning on going to chiropractic school and becoming a chiropractor when he is done playing. TAC: Thank you and good luck Dr. Schroeder.